How to edit Ad Campaigns you've already created by changing settings and creatives. Navigate to 'Events' in the left side panel. Click into the 'Ad' or 'Invite' tab, depending on the type of your campaign, under the Event you select. Click into the Campaign you'd like to edit. Click 'Edit Campaign' in the top righthand corner of the page. You can follow the wizard to find the setting you'd like to edit or you can click into the appropriate section at the top to navigate directly to make your changes. Click 'Save Changes' in the top righthand corner when you've finished making all of your changes. After making any changes to these settings make sure to 'Save Campaign' in the bottom right corner. Disable a Target Segment by clicking 'Options' in the righthand corner and unchecking 'Enabled'. By disabling a Target Segment that group of people will not be specifically targeted by ads, but they will not be excluded from seeing ads if they overlap with another Segment targeted by your campaign. Edit existing Targets by selecting new Segments from the dropdown menu under 'Segment'. 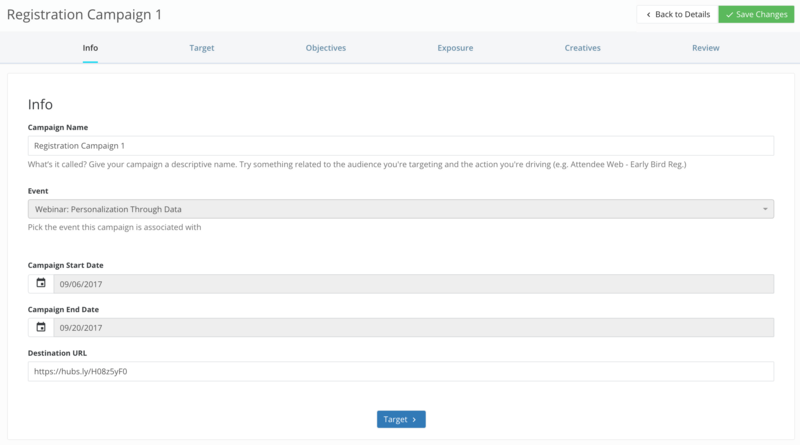 Add new Target Segments by clicking 'Add Targeting' and inputting the desired Segment information. Update existing Goals or add new ones from this tab to track conversions. Conversions are tracked and calculated after a person interacts with your campaign and then joins your Goal Segment for the first time. From the 'Exposure' tab you can update the number of impressions you serve to your Target Segments and the budget for your campaign. Disable creatives to stop them from being shown by changing their enabled status from the dropdown next to 'View'. Add new creatives by clicking 'Add Creative' and either drag and drop your creatives into the file picker, or choose your files from your desktop. You can also use URL links that lead to your creatives. Review your campaign changes and click 'Save Changes' in the top righthand corner to set your updated campaign live.